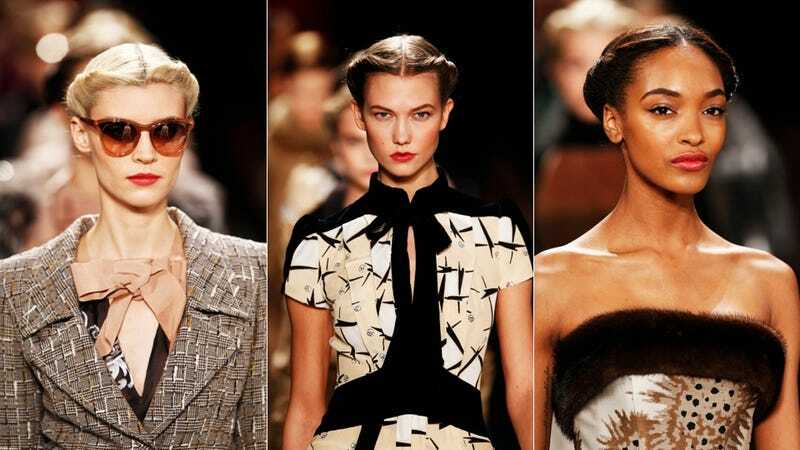 The fall 2013 collection Cynthia Rowley showed today during Mercedes-Benz Fashion Week had a decidedly 1940s vibe: Nipped-in waists, strong shoulders, wide collars, and a teeny hint of Chinoiserie. There's plenty for the working girl: Day dresses, trouser suits, tweedy coats. Sleeves! But you'll also find fur and slinky column gowns for film noir evenings out. Love the off-the-face hair — a modern take on victory rolls — and the one ivory puff-sleeved Princess Leia-esque dress will definitely be on the red carpet soon. Take a look.